Classic car culture thrives on the open road, the driveway, the garage and even in museums. 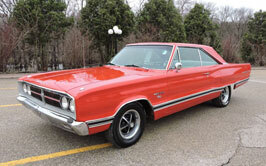 Some collector cars travel the show circuit, but others exist in collections that draw crowds to them. Museums not only show off some great cars, but educate with exhibit themes and atmosphere. Here’s a list of some classic car museums you may want to visit. The Indianapolis Motor Speedway Museum is located on the grounds of the Indianapolis Motor Speedway, a National Historic Landmark. The Museum’s collection encompasses race cars from many series: IndyCar, NASCAR, Formula One, Sprint, Midget, motorcycle races, and drag racing. It also includes a variety of passenger automobiles, many of which were manufactured in Indiana by companies that once had ties to racing. The Simeone Foundation Automotive Museum is a nonprofit institution that celebrates the evolution of racing sports cars with over 65 historically significant cars assembled over a 50 year period by Dr. Frederick Simeone. The institution has numerous special events throughout the year, so keep an eye on their calendar! The old Auburn Automobile Company factory is home to the world’s largest collection of Auburn, Cord and Duesenberg automobiles. MSNBC News named it one of the “Top Ten Gearhead Destinations in the United States,” and is accredited by the American Alliance of Museums. Plan a visit in August and you can be there for the Auburn Cord Duesenberg Festival. See Cars On Line coverage of the event here! You can also see photographs of the museum here! 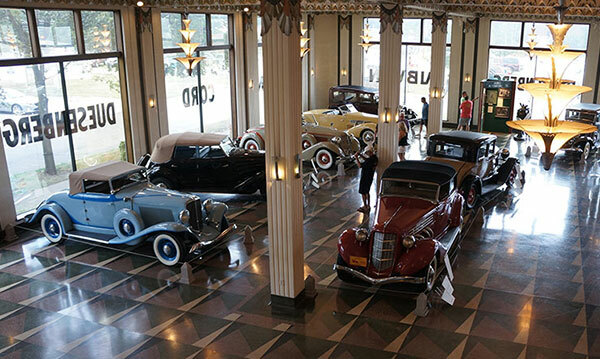 On a 90-acre historic campus midway between Detroit and Chicago is the Gilmore Car Museum. Here, visitors shoot the breeze in an old-fashioned gas station, children stand inches from a 1930 Rolls-Royce that’s from a Disney® movie, and grandparents reminisce about a ’57 Chevy that was the star of their yesteryear. Stroll the campus, eat lunch in the authentic Blue Moon Diner, and walk right up to an amazing collection of over 300 vintage automobiles and motorcycles. New renovations are coming to the Peterson, which includes a brand new aesthetic and indoor restaurant, opening spring of 2016. It’s part of a revitalization project that included the neighboring Academy of Motion Pictures Museum and the Los Angeles County Museum of Art. Together, they make a trifecta of incredible museums to see in Los Angeles. Located atop beautiful Petit Jean Mountain in central Arkansas, the Museum of Automobiles is home to the only Climber automobiles known to exist. 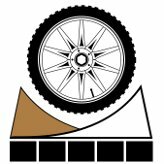 Drop by and experience this unique part of Arkansas’ automotive heritage! A display of over 50 cars includes the 1951 Cadillac driven by Mayor and founder, Winthrop Rockefeller. America’s Sports Car… an exciting legend produced only in Bowling Green, Kentucky. The museum features over 80 Corvettes in periodic settings, including mint classics, one-of-a-kind prototypes, and modern-day wonders of engineering and design. Test your knowledge at interactive trivia kiosks. Displays continually rotate, so no two visits are the same. Late Reno businessman William F. “Bill” Harrah collected and restored antique, classic and special interest autos at his restoration shop for 40 years. The fruits of his labor were donated to the National Automobile Museum which now has more than 220 creatively displayed vehicles. It features multiple permanent and rotating exhibits in addition to the original Harrah Collection. The Henry Ford devotes 90 acres to documentation of the genius of ordinary people, making it the world’s largest indoor-outdoor museum. Part of their impressive collection that ranges in the millions of items is over 100 classic cars and trucks on permanent display. Among them is an 1886 Duryea Motor Wagon and the presidential limousine in which President John F. Kennedy was assassinated in.